You are here: Home / Portfolio / OOH LA LA! 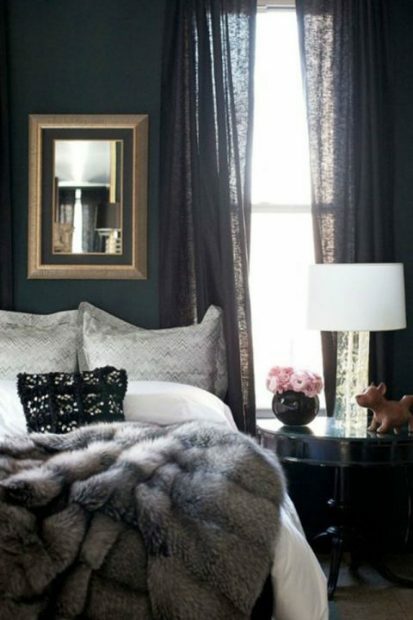 TIME TO GET COZY IN THE BOUDOIR. Yes, the cold weather is here folks, and over the next few months those bitter temps are sure to have us saying “brrr” even indoors. 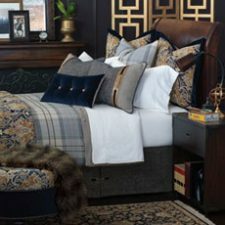 Clients are now looking to cozy up their living spaces for winter so I‘ve put together some suggestions for cozying up the bedroom that are sure to have you longing to switch out your light linens for gorgeous, heavier artillery even if you are one those that like the feeling of being cold under your comforter! I also share the skinny on down comforters and how to choose for winter, plus some of our favorite finds that you can purchase through our studio. Keep Reading! Clients often call come calling in winter for heavier drapes. 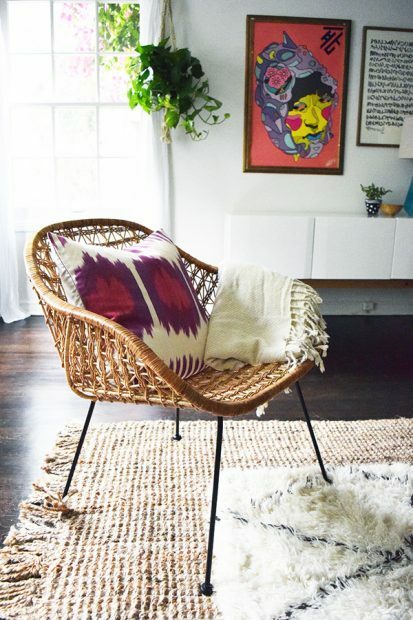 Here, a gorgeous velvet drape in an eggplant hue keeps a minimalist sitting space in the bedroom classic and modern. This summery seasonal palette of yellows and blues transitions into winter with brown velvet drapes hung over sheers. The heavier drape is the perfect compliment to the lightweight sheers and the room’s overall palette and design. Courtesy of Home Design Ideas. If you are hanging heavier drapes you may need new brackets that can hold the weight of such a posh velvet! 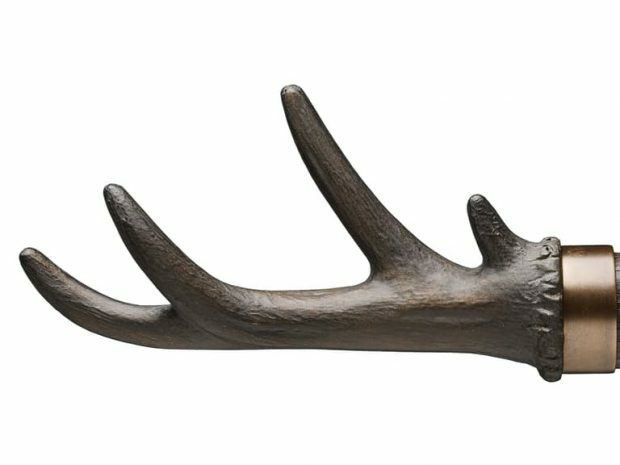 Even if you don’t need new ones Kravet’s Antler Finial Woodland collection just may tempt you to switch out your traditional finial for a more dramatic winter look. These are wintery, rustic and down right cool, and we can get them for you! 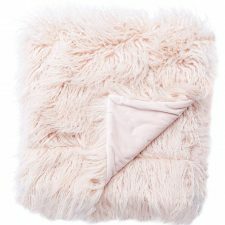 Pile on the extra blankets, faux fur pillows and throws. 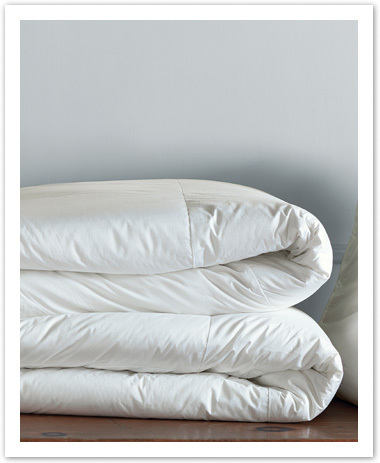 Not only does layering add beauty and a hint of romance to your bedding but also warmth. 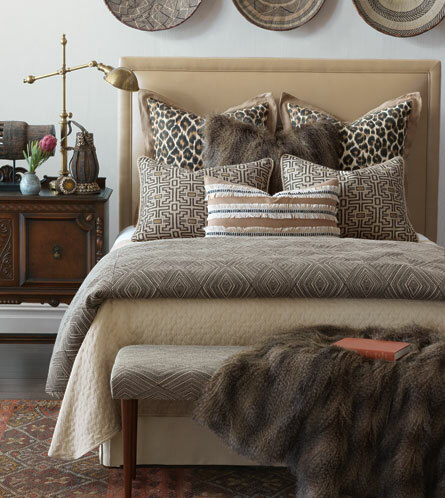 These faux fur pillows and blankets instantly add a cozy element to the entire space. Naya bedding collection. Courtesy of Eastern Accents. Switch to a heavier down comforter. There are plenty of options these days in down comforters so I’m giving you the quick skinny on how to choose. There is such a thing as fill power. The higher the fill (the cushy stuff on the inside of your comforter) the thicker and better quality you will have in the down comforter. Larger packed down creates a more breathable, warmer down and is likely to last longer than lower grade fills. Most “luxury” fills have no less than 700 fill power, while the next best thing, called a ” high” quality down, will give no less than 500 fill and a lower grade, lighter fill is 400 and under. That being said I always switch out my down comforter to a heavier fill in winter. Down comforters by Barclay Butera. Just like on the top of your bed you can also layer underfoot. 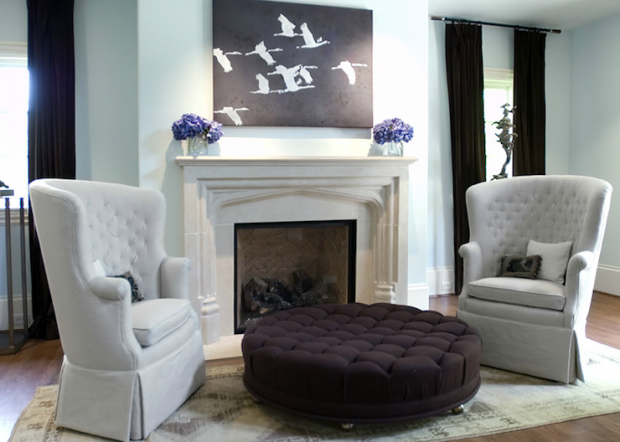 Adding a plush rug over an existing rug or hardwood floor creates a rich, welcoming and cozy look. This creamy, diamond pattern shag is a perfect winter addition to this summery jute rug. Courtesy of The Nectar Collective. 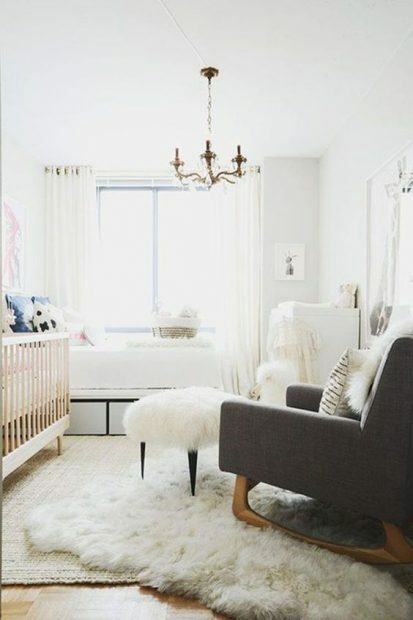 Overnight visits to this nursery got a warm, cozy makeover with perfectly placed shag decor with this rug, ottoman and pillow. Chic underfoot perfection. 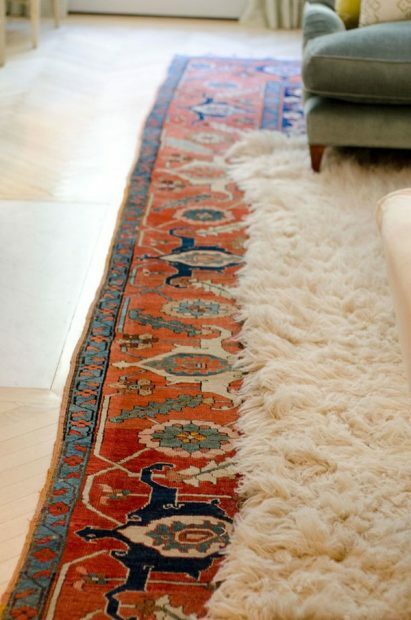 Love how this shag throw rug is layered over a vintage wool rug and hardwood flooring. 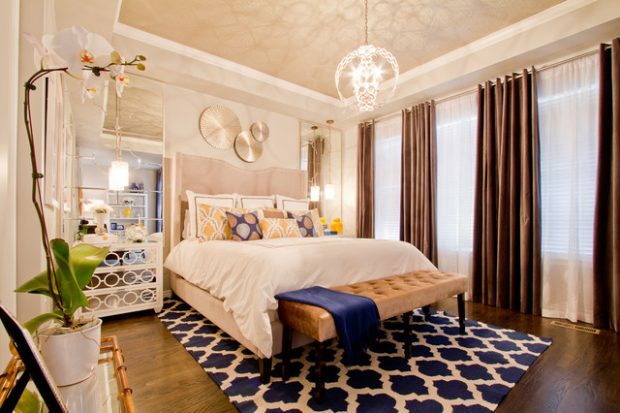 A mix of pattern and placement here works well and keeps this space cozily balanced. Here are some pieces you can add to cozy up your boudoir while instantly adding that cool winter vibe. All items are available through our studio. 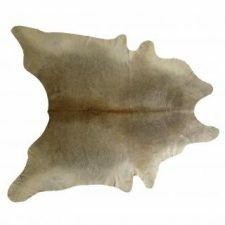 Riley cowhide rug by Kravet. 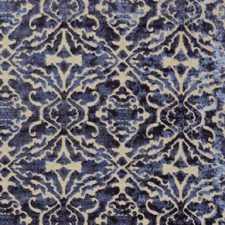 Palazzo velvet fabric for drapery by Scalamandre. Ivory knife edge pillow by Niche Bedding for Eastern Accents. 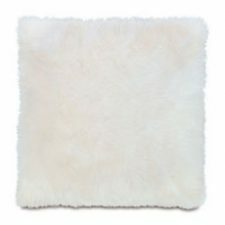 Turkish retro shag rug by Kravet. 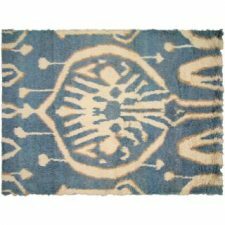 Ikat shag rug by Kravet. 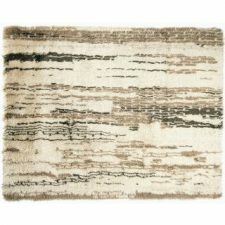 Hamlin Gobi throw in shell by Jaipur Living. 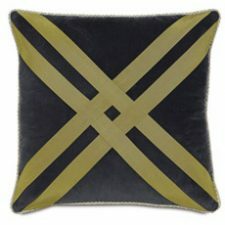 Jackson velvet pillow in charcoal by Eastern Accents. Let us know if you are ready to bring in the heavy artillery and get winter serious in your boudoir or other living spaces. Previous Post: « We Are Honored to Receive Best in Customer Service on Houzz for another year in a row!